NYC, 04/16/2019, 6:00PM. H.G. 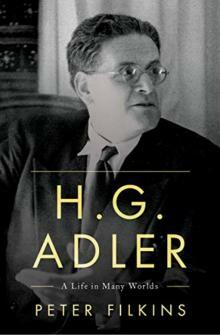 Adler: A 20th-Century Life for the 21st Century. H.G. Adler (1910-1988) was a survivor of Theresienstadt, Auschwitz who later published two dozen books of history, fiction, poetry, sociology, and religion, all of which were dedicated to honoring the memory of those lost in the Holocaust. However, in his time he remained largely unknown, and it is only in the 21st century that his works have gained the audience and resonance they deserve. Author Peter Filkin's authorized biography will explore the importance of Adler's life and writing for how it speaks to the overreach of technology, government, and social controls, as well as the necessity of maintaining human dignity in the face of systemic oppression in our day.